A Better Bitters Filter @Craftzine.com blog. Clever! And fast. Recipe: Sausage Pizza, Topped with Crispy Kale | The Kitchn. We do sausage and kale pizza a lot but often end up improvising, I’ll try this next time. Modern Apizza’s New Spin-off at Seattle’s Safeco Field | Slice Pizza Blog. This might get me to a baseball game. 100 recipes « Gustoso. A list of 100 recipes to try, with links to the best recipe for each one, video when available and lots of resources and variations. Roasted Broccoli Hummus | Not Without Salt. Somehow I find myself craving broccoli these days. Your New Favorite Potato Salad, at Ugly Green Chair. It’s mayo-less! Sprinkle Bakes: Prince William’s Groom’s Cake. This looks so delicious. 100 Ladurée Macarons at Design Mom. Swoon! So very pretty. How to Get Large Slices of Pizza from Small Ovens or Pies | Slice Pizza Blog. So simple. I admit to somehow finding a large slice more satisfying to eat than the same amount of smaller slices. How to Make Salad in a Jar. She uses a vacuum pack machine to keep it fresh. I think I would eat more salad if I had it ready to do like this. This is a Slice ceramic safety cutter meant for opening clamshell packaging. I manage to get papercuts from anything sharp and flat so last Christmas I grabbed one of these in the hopes of avoiding the frustration and the blood and the pain. Opening gifts should not be associated with pain. This has an incredibly tiny ceramic blade in the tip that is just big enough to cut through sturdy plastic packaging but too small to cut skin. I was really delighted when I found there is a small magnet inside so you can keep this on a fridge or a magnet board, so handy. It’s photographed above hanging out with the spring clips and fortune cookie fortunes that I keep handy over my kitchen counter. We’ve even started using our little cutter to slice through tape to open boxes. It’s turned out to be my favorite gadget. Slice makes a range of ceramic products for the office and kitchen and I have my eye on the Precision Cutter as well. Both the Safety Cutter and Precision Cutter are also available at Amazon. Kyle sent Scott home with a bottle of the beer which I had the opportunity to watch him make last month. Don’t be fooled by the name, I mostly observed! Thank you, Kyle, it was delicious. ‘8-Bit Pocket Camera’ – A Glorious Homage to the Gameboy Camera | Touch Arcade. Hipstamatic has failed to grab my attention but this? I want this. Pioneer Woman Actions UPDATE! | Pioneer Woman Photography | Ree Drummond. Want to turn low res web image to higher res print ready image. | Ask MetaFilter. How To: Make A Wedding Bouquet « A Practical Wedding. Science & Crafting – The Crafts Dept. I love the projects they’ve gathered here. Tiny Baby Bunnies Knitting Pattern @Craftzine.com blog. Cute! Shoe makeover, DIY – a set on Flickr. Such cute results! Molly’s Sketchbook: Braided Handle Canvas Tote – the purl bee. I like how simple and calm this is, there is a link to the pattern at the bottom of this post. versus: Sunburst Pillow Tutorial from Guest Anna of Noodlehead. I’m going to make some of these, simple and impressive. Via Capree Kimball on Pinterest. say YES! to hoboken: DIY: Making a Beach Tote Bag. I like the size of this one, and of course I like the nice bright yellow and white stripes as well. Sprinkle Bakes: Breakfast for Dessert: Boiled Custard Eggs, Shortbread Soldiers and Coffee on a Stick. More faux eggs, via Edible Crafts. Hungry Happenings: Fun idea for an Easter Brunch – Carrot Crescents Filled with Egg Salad. These are so cute. Hot Cross Buns | The Pioneer Woman Cooks | Ree Drummond. Yum. Bread roll chicks | Flickr. These knotted bread roll chicks are adorable. I couldn’t find the specific entry but they are from The Secrets of Our Supper. Felt Carrot pattern, at I Make Stuff. (Warning: PDF). I love the line of stitching that dds a bit of detail to these. Bunny Fold Napkins at Martha Stewart. This is an old one but a good one and it’s been popping up on Pinterest lately. And I like it as a last minute way to add Easter decoration. This is the mural I stare at while I’m waiting for the Light Rail to arrive. For some reason the thing I focus on first is always Alice juxtaposed with the rice cooker. Something about the rushed worry next to a quiet kitchen appliance makes me giggle. My camera does that face detection thing and I’m happy to tell you it only recognized Dr. Frankenfurter Elizabeth Taylor there as a human. Design*Sponge » diy project: paper marquee letter lamp. How expensive is cheap lawn equipment? | Ask MetaFilter. A discussion about brands of string trimmers, which we are also looking at buying. Our old rechargeable one wasn’t powerful enough to make it all the way around the lawn. Home-Dzine – Make your own designer fractal mirror, via Curbly. I like this idea. Target’s Limited Edition Home Accessories by Calypso | Apartment Therapy. Something to remember to check out. 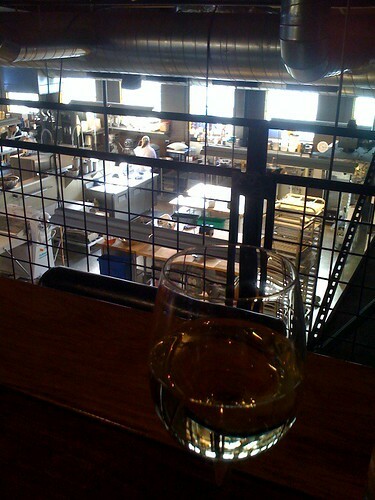 This is my view down into the industrial kitchens from my seat at Serious Pie (as in pizza). Those Hobart mixers mean business. What’s the Difference? Pale Ales, IPAs, & Double IPAs Beer Sessions | Apartment Therapy The Kitchn. How to host a blind wine tasting | HJEntertains. Coconut Margarita – Martha Stewart Recipes. How did I not see these before? Found at a lost Pinterest page. The Best Surface For Baking Pizza, Part 3: Quarry Tiles | Slice Pizza Blog. She outlines all the things that have kept me from using stone tiles in my oven, they just aren’t as convenient as one big pizza stone. Chinese Appetizer Recipe Week: Soup Dumplings | Serious Eats. I love how pipe cleaner chicks always look a bit freaked out. A few quick links to places Not Martha is showing up elsewhere. The April 2011 issue of Family Fun magazine has a version of my Easter Surprise Eggs, shown above. Delish shows my Chocolate Easter Surprise Eggs in their list of Awesomely Decorated Easter Eggs. Parent Map magazine has both versions of Easter surprise eggs in their round up of fantastic ideas for dyeing and decorating Easter eggs. Not Martha is #19 on the list of Top 150 Makers Blog List, so a huge thanks to all of you who come visit me here, we’re # 19! (I guess it doesn’t make a good chant.) We’re in good company, and there are a whole bunch of site that are new to me there. Today was way better than yesterday, or so I thought. At lunch I dropped off the last document needed for our tax people to do our taxes, I got all the stuff needed to make dinner, I gathered and bagged the recycling for collection tomorrow, I got everything ready to take photographs of the Easter project I have in mind for this year, I did dishes, I washed and chopped kale, I cleaned out the fridge, I cleared the dining room table of miscellaneous mail and I was feeling triumphant and smart (I was listening to The Tobolowsky Files, it makes me feel smart) and nearly I felt like I actually had my stuff together until Scott got home and discovered that all of my keys were still in the lock of the door. Just hanging there, forgotten. In my rush to turn off the alarm when I came home I failed to actually remove my keys from the lock. Way to go, me. Anyhow, the photograph above is a sneak peek at what I’m doing for Easter. Sort of. I’m going to experiment with using more images in links posts. A lot of these were found using Pinterest, which I have been liking a lot. Minimal Easter Eggs at Pickles. Very simple idea decorating eggs using white puffy paint, I love this. Homemade Cadbury Creme Eggs | Not Without Salt. These adapted a bit from the Instructables project but I like these because she uses Golden Syrup, which I’m having a bit of a crush on at the moment. Wheat Grass at Design Mom. Good practical tips for growing wheat grass as a project for Spring. Crepe Paper Surprise Carrots, at Martha Stewart. Just like surprise balls and pretty darn cute. Secret Message Easter Egg, made by Present&Correct and seen over at Poppy Talk. This is so sweet. Pixie Dust Easter Egg favor, at Family Fun. A very cute idea. Cake baked in egg shells! Genius! At Delicious Days.